A modern classic which I owned from new in 1991 until 2019. Some 6000 were made between 1990-95 and this is one of the first batch of three in the UK (a red one, a turquoise one and this one, since you ask). Very useful info site at http://www.rocknrollweekend.com/music_man.html. The last pic was taken in sunlight as the indoor shots don’t capture the magenta colour well. Not to everybody’s taste, but it’s quite a rare colour, especially in this dead mint condition with matching rectangular black case and all case candy. Four rare and sublime big-box Gibsons staying over for a few days for fettling and a recording session. Can’t thank my good friends K & N enough for this loan! From left, ’62 J200, ’52 J185, ’53 J200N (also featured in Guitarist issue 442) and ’57 J185N. All in wonderful shape, some slightly more used than others, all play fantastic and each has its own great (loud) voice. Truly an honour to work and be with these things for a while. …is for the purposes of this pic gold. From left, ’61/2 Shoreline Gold Fender Stratocaster, ’17 Polymist Gold Epiphone JB Treasure Firebird 1 reissue & ’54 Les Paul Goldtop. Friend N’s EXC++ ’56 ES140N dropped over for tea with my mint ’57 ES225TN and EXC++ ’60 ES330TN. Darjeeling, anybody? Nah, just rock. Friend N’s latest acquisition, a very clean ’68 Thinline Tele, quite an early model in original Fender case, complete with ashtray, both also in good shape. It came out of the really interesting Hendrix Guitars collection in Italy. Really nice patina and great neck despite it being CBS period. The bridge pickup is quite microphonic, so it’s passing through on its way to a specialist to fix. A great player. From left, ’61 Gibson ES330TC; ’60 ES330TN; ’57 ES225TH; ’61 Epiphone 230T (Casino with very rare metal plate headstock logo ); 59 Gibson ES335TD. 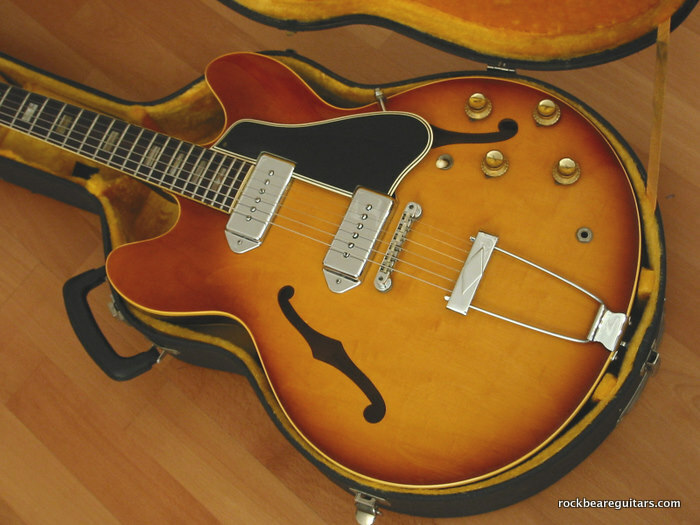 My friend and bandmate R’s ’63 ES335. Once converted to left-hand use and later refinished in black, we restored it by reinstating all the correct parts. It’s a great player. EVEN RARER CHARVEL MODEL 8! Again, not a guest but incoming from reader J. I’ve seen the rare Model 8 in Pink, Turquoise and a rather warmer Orange that the colour they used on the Spectrums, but never one in Desert Sand and in such great condition. I didn’t even know that they had introduced the finish that early. Thanks, J, enjoy your rare bird! I know this web site is mainly about guitars, but you don’t get many fx pedals whose performance and reputation leads them to command secondhand prices of up to $2k! The joy of having one of these around is the ability to calibrate all my more modest drive pedals (some shown surrounding the Klon here) to it, and very interesting that was too. The Klon is super-transparent and best adding fairly small amounts of gain – and apparent reality – to the sound of a decent guitar and amp. Cranking the gain tends to make it sound more like a lot of other pedals. Its secret appears to be threefold. First, the gain control seems to mix the clean and driven tones so you don’t lose definition. Second, it’s possible to adjust it so that it’s completely inaudible. This shows how inherently transparent it is. And third, the drive component is really good, dynamic, touch-sensitive and open, not mushy. It’s built like a tank, is heavy and oversized. Power is 9vdc but via a 3.5mm jack and reverse polarity to most fx, so it’s not particularly pedalboard-friendly unit unless you have a road crew. This one serial #3209 and shows all the obscuring goop these things are famous for. A very welcome visitor to the Rockbeare household and test lab – thanks, Mike! Not really a guest, just some terrific pix in from a reader, but a beautiful example of the rare Charvel Model 8 which preceded the Spectrum of which I’m so fond. 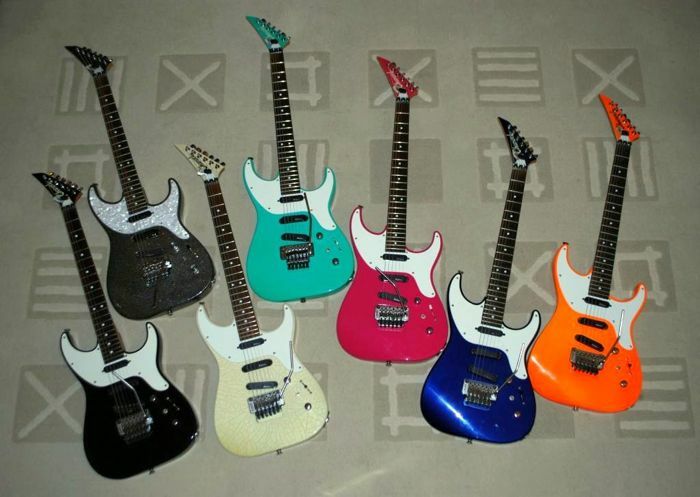 The Model 8 was the short-lived variant which followed the Orange one-off fixed-neck made famous by Jeff Back. Very few were made before it morphed into the Spectrum. This has all the correct features – Jackson-branded Floyd Rose licensed them mounted flat on the body (limited uptremming, downward dives only); no routs around neck plate on rear; even a non-matching Kahler locking nut; and of course the small Charvel logo of the time. It reassures me that my green Spectrum, which has all the same features except the headstock logo and the Kahler-branded nut, is likely to be a very early one. The serial # sits within the range covered by my six Spectrums, adding weight to the suggestion Charvel bought a job lot of plates and did not alloy them sequentially in date order. 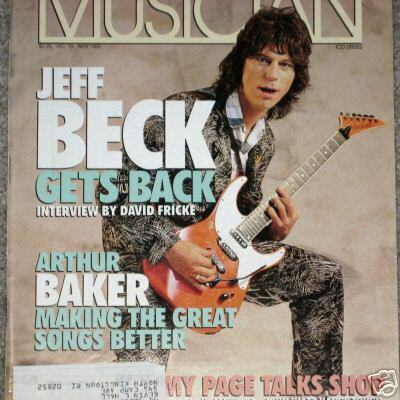 Sincere thanks to reader Lane Sparber for these great pix of this rare guitar. A nice single-cut dropped by for a few days. Very creamy sound though harder to play because of the original skinny frets. Minty, very nearly as nice as mine! Not really guests, just a nice group shot of my four mint, all-original golden age semis : from left, 59 Gibson ES335TD; ’61 Gibson ES330TC; ’61 Epiphone 230T (Casino with very rare metal plate headstock logo ); ’60 ES330TN. They all look fantastic, play like a dream and sound fab. SOME NICE ‘BIRDS FOR SUNDAY LUNCH! My friends N’s ’64 Firebird VII (left) and R’s recent reissue (right) visited my Firebird 1 (centre) for a raucous Sunday lunch. Here’s them sleeping off their reveries in the afternoon sun…. ’64 Firebird V, 90’s reissue V with stop tailpiece and two identical 2012 Custom Shop Historic reissue I’s, the one on the left now mine… (Two Lazy J 20’s and one of a pair of oversized reissue Marshall Bluesbreakers in the background. Yum). …and even fewer in this kind of condition, explained by its’ allegedly spending its previous twenty years in someone’s attic. Now residing at a mate’s in leafy Buckinghamshire and photographed on the one day in the last eight months when the sun was shining. 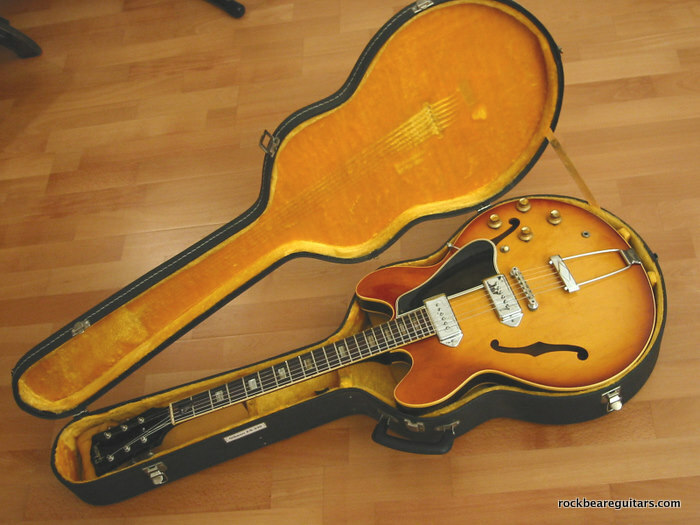 An Ibanez model 2663 from, we think, ’76, the predecessor to the more famous Iceman models which share the same body shape. Plays really well, nice frets, slightly narrow neck redolent of 70’s Ibanez before the wide, flat brigade took over. The electrics were a bit dirty but cleaned up great, and the humbuckers are quite low output. They sound a bit one-dimensional clean but really get interesting with overdrive, somehow a bit a like a good Gretsch. And let’s face, it, you don’t play a guitar with this shape through a clean amp, do you? Do you? My friend S’s fantastic ’60 burst – all ’59 features, fat neck, big frets, teaburst going on lemondrop with plenty of flame and medullary lines and screaming pickups – came to visit my ’58 recently. F**k. Here’s a pic of the tea party – looks very sedate. I can assure you it was NOT. Not a guest, but an instrument I used to own and which previously belonged to Huw Lloyd-Langton of early Hawkwind, RIP and came to me via Ian ‘Sid’ Bishop. Great condition, lovely colour, but I could never get on with the skinny later 60’s Gibson neck profile and I found the nickel covers sucked the tone of the P90’s. A pale shadow compared to my ‘60 and ‘62 models. 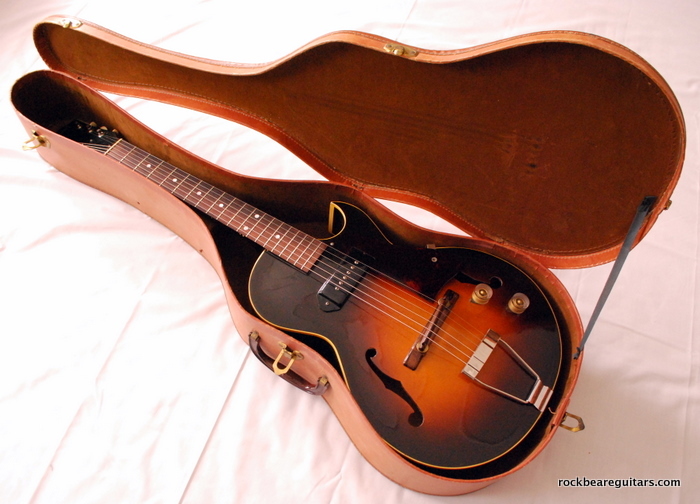 I am interested in the Ibanez 2663 if it is for sale. Would you please contact me if this is the case. Sorry, not for sale at this time. Best wishes anyway.